Located just 2 hours north of Boston, accessing a ski resort has never been easier. 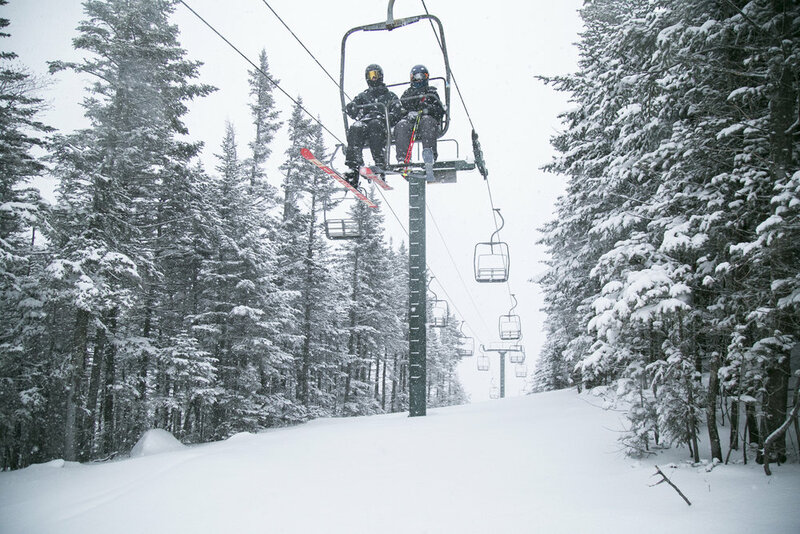 Look no further for everything you need to know at Waterville Valley Resort, including lift tickets, rentals, lessons, lodging and more. We pride ourselves on convenience, located just two hours from Boston (map). Getting to Waterville Valley is fast and easy! Consider us your gateway to the White Mountains. We’re conveniently located just two hours north of Boston and the first ski resort you see on I-93. Take exit 28 and head east on Route 49 where you’ll find us nestled in the Valley. We suggest arriving early in order to find the best parking space, in close proximity to the Base Lodge. Valet Parking is also available for $25, allowing for a worry-free parking experience. Just pull into the unload area and hand over your keys to one of our valets. At the end of the day, we’ll bring your car to you. If you chose to snooze the alarm, we suggest going straight to a parking spot. We have shuttles that will bring you and your gear right to the Base Lodge. For those with kids or a lot of gear, we also have a five minute load/unload area, located in front of our Base Lodge. Please note, these areas are reserved for drop off/pick up only. Vehicles left unattended in these areas will be towed. You can purchase a lift ticket by visiting our ticket windows or you can buy online and save up to 50%. Ticket windows are located in the front of the Base Lodge facing the parking lot. Renting equipment? Skip the ticket window and go straight to the Rental Shop (left side of the base area) they will take care of all your needs in one spot. Need a lesson? Go straight to the Snow Sports school desk (first floor, base lodge). You can get your lift ticket and your lesson at the same time. For current ticket pricing, visit our Lift Tickets page.If this is your first visit with us you will receive a reloadable RFID card. This is your lift ticket. It works the same way as a regular lift ticket would, minus the lift lines. For more information on how an RFID card works click here. Need or want to take a lesson? Stop by our Snow Sports office located on the ground floor of the Base Lodge. Using the latest equipment and teaching techniques, our Snowsports Coaches are fully committed to your enjoyment. Lift tickets are also available for purchase at the Snow Sports office. Go directly to the Top Dog Rental Shop (located just to the left of the Base Lodge, across the courtyard) to sign up for your lesson. Lessons are at 10:00am and 1:00pm on weekends / holidays, 10:00 and 1:00 on weekdays. Lessons aren’t just for beginners. If you’re looking to progress your skills to the Next Level, you can sign up for Private Lessons and various other group lessons and clinics at the Snowsports Desks located on the first floor of the Base Lodge. (Lift tickets are available here too). Group lessons are available for ages 7 thru adult. Group lesson times are at 10:00am and 1:00pm on weekends / holidays and 10:00 and 1:00 weekdays. Our Kids Kamp program features an all day Kamp for ages 3 - 12. Find out more information about Waterville Valley's Legendary Snowsports School here. If you just need to rent equipment, we have a rental shop in the base area. The Rental Shop is located just to the left of the Base Lodge, across the courtyard. You can also purchase lift tickets at the rental shop. We also have high-end demo skis available at our retail shop, Sport Thoma. For more info on rental equipment click here. Waterville Valley grooms the entire mountain every day, with two shifts of grooming operators. However, on a powder day things run a little differently. We’re skiers and riders too, and we love powder just as much as you do. We want every level of skier/rider to enjoy the conditions. After a storm we groom out the green circle trails 100%. Blue square trails will have one half of the trail groomed out, while the other half of the trail will be left untouched for powder hounds. Black diamond trails will also be left untouched, with 100% powder. Come for the skiing and riding, stay for the relaxation. Unwind after a long day on the mountain at one of our hotels or condos. Check out our many lodging options to find what fits your needs the best. Hotels, condos, condo-hotels.... we've got you covered. Call our central reservations department at 888-462-9887 or click here for the most up-to-date rates and reservations. Experience Waterville Valley’s nightlife and après. We have plenty of options to choose from! Right in Town Square you can enjoy everything from Mexican, pizza, bars, and cafes to more sophisticated steak and seafood restaurants. For all of our wonderful dining options, click here. Town square has a number of shops ranging from gift stores featuring products from local artists, toys, books, a mercantile, to outdoor gear stores. Consider it your one stop shop during your stay in Waterville Valley. For a list of stores, click here. Sunscreen and lip balm - In the higher elevations of the mountain environment, the sun's rays are less filtered. Snow also reflects sun rays, making them even more intense. You can get severely sunburned very quickly. Wind will burn your skin, too. Hand and toe warmers - Hand and toe warmers will help you stay warm longer. On bitter cold days put these in your gloves and on the tops of your toes to maximize your skiing and riding. Neck gaiter or face mask - On those cold and windy days you’ll benefit from wearing a neck gaiter or face mask. These will not only keep you warm, but they’ll protect your face from frostbite and wind burn. Wool socks - Wool helps wick moisture. Regular cotton socks will make your feet go cold quick and put you at risk of frostbite. Keep your feet warm by wearing a nice pair of wool socks. Water & snacks - Sun, wind, perspiration and altitude rob your body of fluids and the cold burns calories quick. Replenish your body with water and snacks. If you forget water and snacks, we will also have some for sale in the Base Lodge. Goggles and/or sunglasses - Infrared and ultraviolet rays can be extremely harmful to your eyes, especially at higher altitudes. Good quality sunglasses are an important investment. Wind, blowing snow, cold, and fog can also be very uncomfortable to your eyes. Goggles are every bit as important as sunglasses. Always take both with you, even if the day seems perfect. Remember, weather changes rapidly in the mountains. It's easy to be caught unprepared. Wearing layers keeps you warmer and lets you adjust clothing as the day gets warmer or colder. You can add or remove layers to remain comfortable. The two most important layers are the one closest to your skin and the one on the outside. The best underwear is absorbent and "wicks" perspiration away from your skin. The outermost layer, including pants, should be wind and water resistant. Clothes such as jeans or sweatpants absorb water, making you wet and cold. You can lose tremendous amounts of body heat through the top of your head. Wear, or carry, a hat at all times. WEAR A HELMET - IT'S A SMART IDEA: Many snowsports enthusiasts wear helmets. The best ones are light, comfortable, warm, and allow you to see and hear clearly. If you use one, you not only provide yourself added protection, you never have to worry about hats. Use a helmet especially designed for snowsports. Rentals are available at Top Dog Rental shops. UNDERSTAND YOUR FITNESS & ABILITY LEVEL: Snow sports are for everyone - regardless of age, body type and fitness level. But it's important to work within your own fitness and ability level. Pace yourself, don't venture too far from resting places and shelter, and don't overdo it. We want you to challenge yourself to get better, but do so safely. Consider taking a lesson to help yourself progress to the next level of skiing and riding. GO WITH THE FLOW: Always be aware of your surroundings. If you come to a trail merge, look up hill and yield to any downhill traffic just as you would when merging onto the highway. The skier or rider in front of you always has the right of way. If you need to pass someone, make sure you’re giving them space to still complete their turns. The mountain has no speed limit, but be respectful of your speed in learning areas and in popular beginning areas. Just like a car, your skis and board need regular maintenance for optimal performance. Sharp edges and a nice coat of wax can dramatically improve your experience on the snow. If you don’t know how to tune your gear yourself, drop off your skis/board at Sport Thoma and they’ll take care of all your tuning needs. The early bird catches the worm, and the early skier/rider gets first tracks. Parking is easier first thing in the morning and you’ll be treated to untouched corduroy snow or untracked powder on a snow day. The lunchtime hours are busy in the Base Lodge. There’s longer lines for food and less seating available. Eat early or eat late. Go in for lunch around 11am and then enjoy the slopes while everyone else is eating. Or work up an appetite by waiting until 1pm for lunch.